VATICAN CITY (CNS) — Pope Francis receives countless gifts, but most do not require anything in return. However, at his audience with members of the military April 30, the pope received a small gift with a tradition — and obligation — attached. 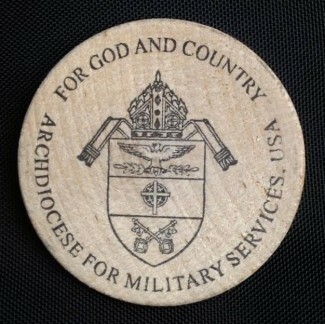 Auxiliary Bishop F. Richard Spencer of the U.S. Archdiocese for the Military Services gave the pope a military challenge coin with a prayer from St. Francis of Assisi stamped on it. 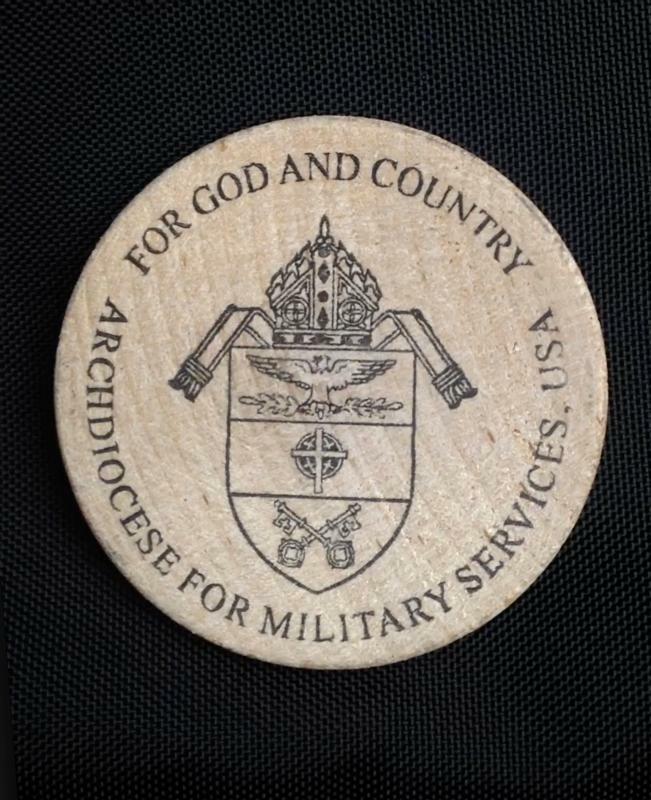 Bishop Spencer, who ministers to U.S. service members in Europe and Asia, explained to the pope — and then to Catholic News Service — the tradition of military challenge coins. “A long-standing military tradition is for leaders to ‘coin’ a person as an outward sign of appreciation and admiration for their actions and service,” the bishop said. Military challenge coins come with a catch. “The next time the two of you meet after being ‘coined,’ the person receiving the coin must show the coin from the original presenter. If they do not have the coin with them, then they owe you a beer!” said Bishop Spencer, whose began his military service as an Army officer in 1973. In offering wine, the pope was in fact keeping with the original European heritage of challenge coins. The history begins in World War I when an airman with the U.S. Army Air Service was shot down and captured by the Germany army, who took away his identification and belongings. U.S. Airman 1st Class Deana Heitzman, who wrote a recent article about challenge coins for U.S. Air Force websites, explained the story: “While escaping from the grasp of the Germans, the pilot made his way to France, where they believed he was a spy and sentenced him to be executed. To prove his identity and save his life, he revealed a bronze medallion with his flying squadron’s emblem, confirming he was an American pilot. The French spared his life and celebrated by giving him a bottle of wine instead,” wrote Heitzman. Carrying a unit coin became a tradition for the saved pilot’s squadron in Germany. Coin challenges developed as a way to ensure everyone was carrying their coin. If they didn’t have it, they would be buying drinks. But coins are much more than just a fun tradition that leads to drinks. They also are exchanged on important occasions and mark significant events in a service member’s career. 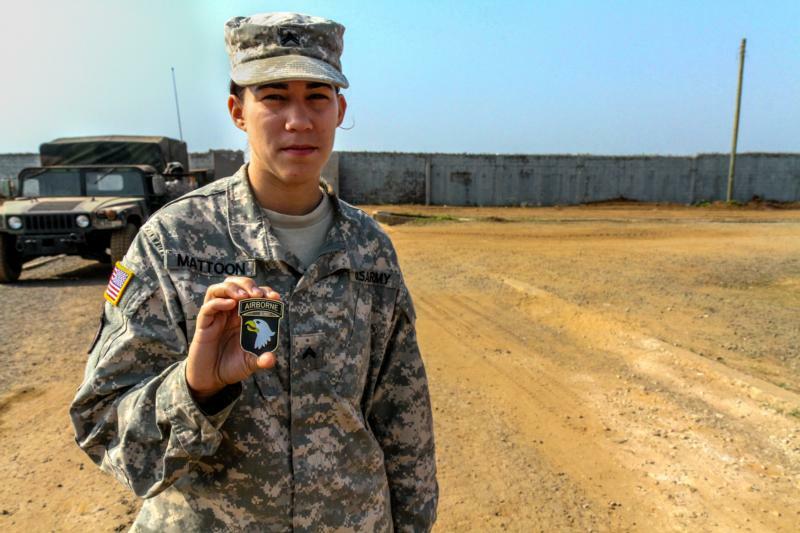 Many service members display important coins in cases as a reminder. Pope Francis would have no trouble participating in a coin challenge. The Vatican has a long history of creating papal coins. The 2016 Pope Francis coins available from the Vatican are genuine euro tender and range in value from one euro-cent to a 50-euro gold coin that sells for 1,090 euro.